Mardi Himal Trekking, Mardi Himal Base Camp Trekking is newly opened and stunningly beautiful trekking in Annapurna region of Nepal. Mardi Himal Base Camp Trek trail is situated just east of the Annapurna Base Camp. It is offers an opportunity to explore traditional villages, infinite and diversity of culture, amazing views of mountains and tempting views of River. 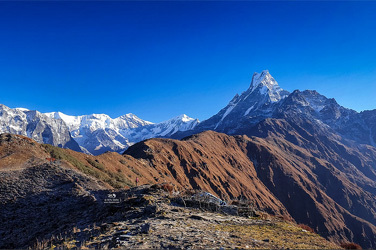 The Mardi Himal trek goes through ancient rhododendron forests, to what feels like the face of the mountains themselves, as you get up close with Mardi Himal, Machhapuchhre (fish tail), Annapurna South, Hiunchuli, Ganga Purna and Annapurna I. The Mardi Himal trek is possible to starts from Kande and Dhampus Phedi but our below given Mardi Himal Base Camp trek itinerary is starts from Dhampus Phedi after 40 minutes driving from Pokhara. First steeps trail to Dhampus village then level and steeper walk to Pothana (1950m) then up again to Deurali (2100m). There is a right turn in Deurali sign posted “Forest Camp” the trail is through jungle, at first up then undulating on the top of a ridge, there is a section just over half way where the trail drops steeply and then slowly gains height and then back onto the ridge and into Forest Camp (2554m). The trail is initially quite steep leaving Forest Camp but soon gets less steep as you again get upon the ridge. The trail leaves Low Camp again in jungle, but the trees soon start to get smaller and after about one hours trekking broke out of the jungle and onto the open ridge with spectacular views of Machhapuchhre ahead and Annapurna South to my left. It is possible to continue trekking along the ridge for another 4 to 5 hours to Mardi Himal Base Camp (4500m) and return to High Camp in around 4 hours. This makes a long day but there is also a viewpoint about half way, the amazing view can be from here. After that, we trek down to High Camp then continue to Low Camp then we trek Sidhing and Saidighatta. From Saidighatta, we drive back to Pokhara and Kathmandu. Mardi Himal area local people run the tea houses/lodges and homestay to provide the accommodation and meals for the trekkers and climbers so most of trekkers booked the Mardi Himal Base Camp trek as Tea Houses.